I do a wonderful bike ride on a 20-mile rail-trail along Florida's west coast. It's a paved, 15-foot wide path that carries all ages and skill levels. They walk, rollerblade, bicycle, tricycle, jog, and push strollers. Because it is an urbanized area, the trail is heavily used, and obviously well-liked by the community (one woman told us building the trail was the best thing the county ever did). I shoot a full roll of film along the way, partly because I'll want to show some of the features of the trail to local folks in an effort to convince them that we need more of those types of trails in Gainesville. I'm starting to get optimistic and excited about our willingness to do so in the near future, because the federal government is starting to provide money (for the first time in about 50 years) to build "quality-of-life" facilities like trails and bike lanes and sidewalks. Of course, the money is rather paltry, but at least it's a start. In 1888, the first train of the Orange Belt Railroad arrived in St. Petersburg on the rail-trail corridor. 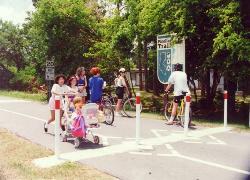 By 1983, the FDOT purchased the rail right-of-way, and in 1984, the Pinellas Bicycle Advisory Committee proposed using the right-of-way as a rail-trail. In 1989, the rail-trail project was approved by the County, and $1.5 million was appropriated for the first 15-mile segment.